Multiple sclerosis (MS) is a severe central nervous system disease. Experimental autoimmune encephalomyelitis (EAE) mimics MS in mice. We report that spontaneous development of EAE in RAG-1-deficient mice transgenic for a myelin basic protein (MBP)-specific TCR (TgMBP+/RAG-1−/−) requires expression of the T cell costimulatory molecule CD28. Surprisingly, T cells from CD28−/−TgMBP+/RAG-1−/− mice proliferate and produce IL-2 in response to MBP1–17 peptide in vitro, excluding clonal anergy as the mechanism of CD28-regulated pathogenesis. Proliferation of autoaggressive T cells was dependent on the concentration of the MBP peptide, as was the development of MBP-induced EAE in CD28-deficient PL/J mice. These results provide the first genetic evidence that CD28 costimulation is crucial for MBP-specific T cell activation in vivo and the initiation of spontaneous EAE. Multiple sclerosis (MS)3 is a disease of the central nervous system (CNS) that affects mainly young adults. It constitutes a major socio-economic burden because of its unpredictable course and limited treatment options. Various studies have indicated that MS is an organ-specific autoimmune disease in which an immune response mounted against myelin sheath components results in chronic inflammation, demyelination, and gliosis (1). CD4+ T cells and MHC class II-bearing APC are found in MS inflammatory sites (2), and T cells from patients, as well as from healthy controls, respond to myelin components in vitro (3). Moreover, certain MHC class II alleles have been associated with MS susceptibility (4). Ag-induced experimental autoimmune encephalomyelitis (EAE) in mice mimics human MS and has been extensively studied to uncover its pathogenetic mechanisms. For instance, EAE can be induced in H-2u PL/J mice following immunization with myelin basic protein (MBP) in CFA. The presence of CD4+ T cells and T cell activation by APCs are necessary and sufficient conditions for the development of experimentally induced EAE (5, 6). In addition to immunization-triggered EAE, spontaneous EAE has been found to develop in MBP1–17 peptide-specific TCR transgenic mice (TgMBP+) of a RAG-1-deficient background (7). Ag-specific activation of T lymphocytes requires two signals, one by the TCR and a second by costimulatory molecules (8, 9, 10). In the best-studied costimulatory pathway, CD28 expressed on T cells interacts with the B7 counterreceptors (CD80 and CD86) expressed on APC (9, 10). Since TCR ligation in the absence of CD28 costimulation renders T cells anergic (11) and CD80/CD86 overexpression in peripheral organs can mediate autoimmune disease (12, 13), the idea has been put forward that potentially autoaggressive T lymphocytes normally remain inactive because tissue cells cannot provide the costimulation necessary for T cell activation. Therapeutic interventions targeting the CD28/B7 costimulatory pathway have been successfully attempted in several autoimmune disease models, including Ag-induced EAE (14, 15, 16). However, the mechanisms that are involved in the initiation and pathogenesis of spontaneous EAE are elusive. To address the role of the CD28 costimulatory pathway in the pathogenesis of spontaneous EAE, we introduced a CD28-null mutation (17) into TgMBP+RAG-1−/− mice (7). We provide the first genetic evidence that CD28 costimulation is crucial for the development of spontaneous EAE. Our results also suggest that CD28 does not regulate immunological anergy but rather adjusts the threshold for the activation of autoaggressive T cells. Transgenic mice (TgMBP+) bearing a TCR directed against MBP were generated using α and β TCR sequences from an encephalomyelitogenic T cell clone and have been previously described (7). These animals were maintained in a RAG-1-deficient (18) and H-2u haplotype background (TgMBP+RAG-1−/−). The CD28-null mutation, also previously described (17), was backcrossed for six generations into TgMBP+RAG-1−/− mice that develop spontaneous EAE, and into PL/J mice that develop EAE following immunization with MBP. PL/J mice were purchased from The Jackson Laboratory (Bar Harbor, ME). Only littermate mice were analyzed in all experiments. Mice were kept under pathogen-free conditions at the Ontario Cancer Institute Animal Facility (Toronto, Canada) in accordance with institutional guidelines. For the experimental induction of EAE, CD28-deficient PL/J mice were immunized with whole MBP (Sigma, St. Louis, MO) in CFA at doses of 200, 400, and 600 μg per mouse on day 0, followed by i.v. administration of pertussis toxin (500 ng per mouse; List Biochemical Research, Campbell, CA) on day 0 and day 2 (6). The development of EAE was followed for up to 100 days in MBP-immunized CD28−/−PL/J and control CD28+/−PL/J littermate mice, and for up to 300 days in CD28−/−TgMBP+RAG-1−/− and control CD28+/−TgMBP+RAG-1−/− littermates that developed spontaneous EAE. EAE severity was graded as follows (6): level 1, limp tail; level 2, partial hind leg paralysis; level 3, complete hind leg paralysis; level 4, front leg weakness; level 5, moribund/death. Mice reaching grade 4 or 5 of disease severity were sacrificed according to the ethical guidelines of the Canadian Medical Research Council. At different time points following MBP immunization of PL/J mice, the presence of MBP-specific autoantibodies was determined from serum samples. MBP-specific IgG and IgM autoantibody titers were determined by ELISA using intact MBP as Ag (6). Single cell suspensions of thymocytes, spleen cells, and mesenteric lymph node cells were prepared as described (7), resuspended in immunofluorescence staining buffer (PBS, 4% FCS, 0.1% NaN3), and incubated for 30 min with the appropriate mAbs. The following mAbs were used: anti-CD3ε (phycoerythrin (PE)-labeled), anti-CD4 (PE-labeled), anti-CD8 (FITC-labeled), anti-CD45RB (FITC-labeled), anti-TCRαβ (FITC-, or PE-labeled), anti-B220 (FITC-labeled), anti-CD28 (PE-labeled), anti-CD69 (FITC-labeled), anti-CD25 (FITC-labeled), anti-CD44 (PE-labeled), and anti-Vβ8.1/8.2 (PE-labeled). All mAbs were purchased from PharMingen (San Diego, CA). All staining combinations were as indicated in the figure legends. Biotinylated Abs were visualized using Streptavidin-RED670 (Life Sciences, St. Petersburg, FL). Samples were analyzed by flow cytometry using a FACScan (Becton Dickinson, Mountain View, CA), and 10,000 events were gated by forward and side scatter. T cells were negatively enriched from lymph nodes of CD28+/−TgMBP+RAG-1−/− and CD28−/−TgMBP+RAG-1−/− mice using affinity columns (R&D Systems, Minneapolis, MN). Purified (>95%) T cells (2 × 105/well) were cultured in triplicate in round-bottom 96-well plates (Costar, Cambridge, MA) in freshly prepared Iscove’s Modified Dulbecco’s Medium (10% FCS, 10−5 M 2-ME). T cells were activated using CD28+/−TgMBP+RAG-1−/− splenic APC (2 × 105/well; inactivated using 2000 rad γ-irradiation) pulsed with different concentrations of the specific acetyl-MBP1–17 peptide (ASQKRPSQRSKYLATAS). T cells were cultured for 60 h, pulsed with 1 μCi [3H]thymidine per well and harvested 12 h later. T cell culture supernatants were assayed in triplicate for IL-2 by ELISA (QuantikineM kit; R&D Systems). In the case of MBP-induced EAE, CD28-deficient PL/J and control CD28+/−PL/J littermate mice were immunized with whole MBP (200 μg per mouse), as described above. Two weeks later, lymph node T cells were obtained and cultured in presence of different concentrations of whole MBP, followed by [3H]thymidine pulsing. Analyses of incidence (EAE-free survival) were conducted using a multiple-sample survival analysis (extension of Gehan’s generalized Wilcoxon test), by which a score is first assigned to each survival time using Mantel’s procedure (19). Next, a χ-square value is computed based on the sums for each group of this score. EAE severity between groups was compared using ANOVA. Differences were considered to be statistically significant at p < 0.05. MBP-specific TCR transgenic mice express a Vβ8Vα4TCR on T cells, and these cells develop into CD4+ Th cells during thymocyte selection (7). Lymph nodes from TgMBP+RAG-1−/− mice contain >90% CD4+TgMBP+ T lymphocytes (Fig. 1⇓) and lack B lymphocytes due to the absence of recombinase (RAG) activity (7). Thus, TgMBP+RAG-1−/− mice harbor a single Ag receptor reactive to the MBP1–17 peptide. Analysis of lymph node cells, thymocytes, splenocytes, and PBL from CD28−/−TgMBP+RAG-1−/− mice showed that the absence of CD28 did not affect the development or numbers of CD4+TgMBP+ T lymphocytes (Fig. 1⇓, and data not shown). Similarly, expression levels of the transgenic TCRαβ-chain, CD3 coreceptors, CD45 and the activation markers CD69, CD25, and CD44 were not altered in the absence of CD28 expression (Fig. 1⇓, and data not shown). CD28-null mutation does not alter lymphocyte differentiation or lymphocyte populations in TgMBP+RAG-1−/− mice. Total lymph node cells were isolated from 6-wk-old CD28+/−TgMBP+RAG-1−/− and CD28−/−TgMBP+RAG-1−/− littermate mice and stained with anti-B220-FITC to detect B cells, anti-CD3-PE to detect T cells (left panels), or anti-CD4-FITC and anti-TCRVβ8-PE to detect expression of the transgenic MBP TCR (right panels). One result representative of five experiments is shown. It has been previously shown that in a RAG-1−/− background, all TgMBP+ mice develop EAE (7). Similarly, 100% of CD28+/+TgMBP+RAG-1−/− and 85% of CD28+/−TgMBP+RAG-1−/− mice developed spontaneous EAE in our animal colony (Fig. 2⇓a). The affected CD28+/+ and CD28+/−TgMBP+RAG-1−/− mice developed disease of similar severity (Fig. 2⇓b), suggesting that CD28 gene dosage influences the incidence but not the severity of the disease. In contrast to CD28-expressing mice, 90% of CD28−/− TgMBP+RAG-1−/− mice were free of disease through a 300-day follow-up period (p = 0.00000 as compared with CD28+/− and CD28+/+ mice). However, two CD28−/−TgMBP+RAG-1−/− mice that were affected developed full severity EAE with disease scores of 5 (Fig. 2⇓b; see Material and Methods for scoring criteria). These results show that CD28 costimulation in T cells is crucial for the pathogenesis and initiation of spontaneous EAE in vivo. CD28-null mutation abrogates spontaneous EAE. Incidence of spontaneous EAE (a) and severity (EAE score) (b) among CD28+/+TgMBP+RAG-1−/−, CD28+/−TgMBP+RAG-1−/−, and CD28−/−TgMBP+RAG-1−/− littermate mice. The differences in EAE-free survival and the mean EAE score between CD28−/− (n = 29) and CD28+/+ (n = 8) or CD28+/− (n = 35) littermates were statistically significant (respectively, Kaplan-Meyer survival curves [p = 0.00000] and analysis of variance [p = 0.00000], based on a 300-day follow-up period). EAE scores of individual mice are shown in b. Open bars indicate mean EAE scores of all mice in each group. Result representative of three experiments is shown. It has been previously shown that TCR ligation in the absence of CD28 costimulation renders T cells anergic (11). Accordingly, CTLA4-Ig, which blocks the interaction between CD28 and its ligands CD80/CD86, has been used in the treatment of autoimmune diseases to inhibit T cell activation and induce immmunological tolerance in vivo (14, 15). 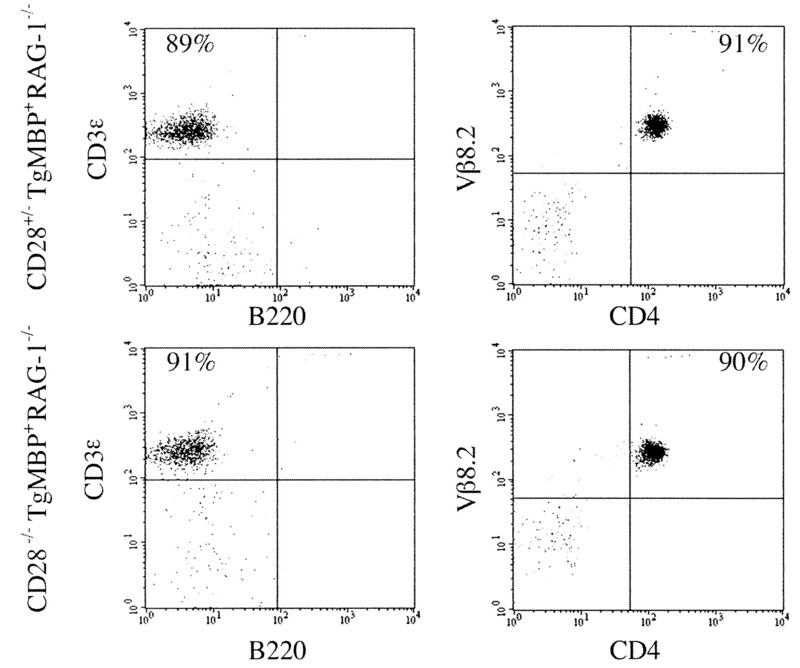 To investigate the possibility that CD28-deficiency abrogates the pathogenesis of spontaneous EAE by inducing anergy and T cell unresponsiveness, we analyzed the proliferative response and IL-2 production of CD4+TgMBP+RAG-1−/− T cells in vitro. Surprisingly, CD28-deficient CD4+TgMBP+RAG-1−/− cells were able to proliferate in response to MBP1–17 peptide in a dose-dependent fashion, albeit at lower levels than T cells from CD28+/−TgMBP+RAG-1−/− mice (Fig. 3⇓a). Moreover, IL-2 production by CD28+/−CD4+TgMBP+RAG-1−/− and CD28−/−CD4+TgMBP+RAG-1−/− T cells was similar and also concentration-dependent (Fig. 3⇓b). These results indicate that CD28 plays a role in controlling the activation of autoaggressive TgMBP+ T cells, depending on the concentration of the autoantigen. 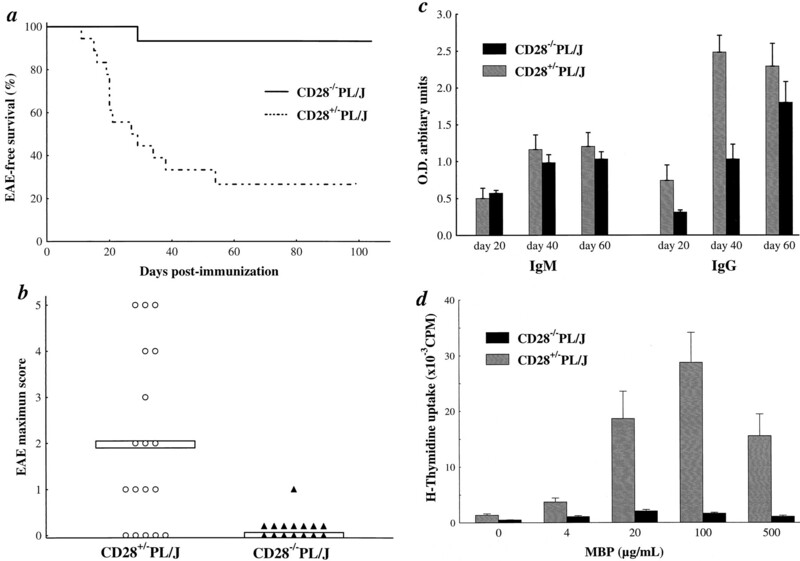 Proliferation and IL-2 production by CD28−/−CD4+TgMBP+ T cells. 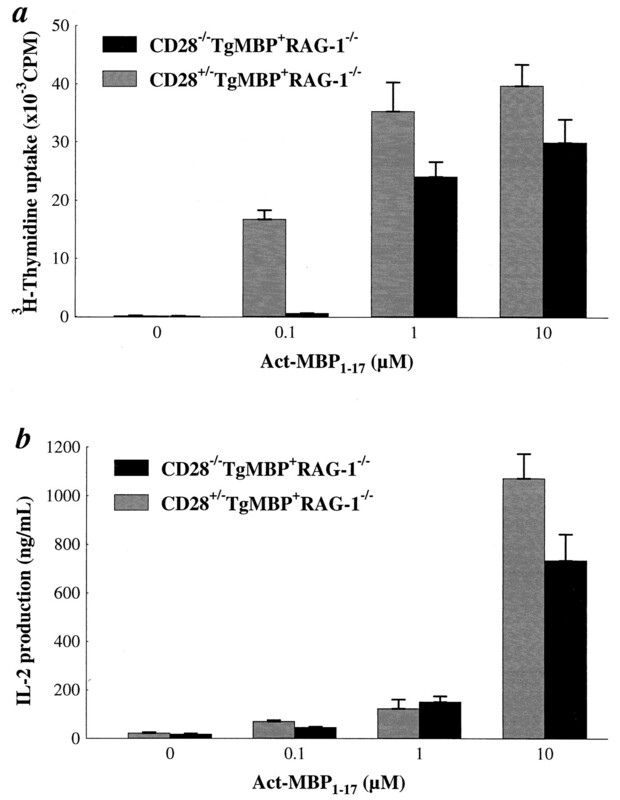 Proliferation (a) and IL-2 production of (b) CD4+TgMBP+ T cells induced with MBP1–17 peptide. Purified lymph node T cells (2 × 105 T cells/well) from CD28+/−TgMBP+RAG-1−/− and CD28−/−TgMBP+RAG-1−/− littermate mice were activated with irradiated (2000 rad) CD28+/− APCs pulsed with the indicated concentrations of MBP1–17 peptide. Unactivated T cells are shown as controls. After 60 h of stimulation, proliferation was determined by [3H]thymidine uptake. T cell culture supernatants were assayed in triplicate for IL-2 by ELISA. Mean values (±SEM) of [3H]thymidine uptake and IL-2 levels are shown. One result representative of four experiments is shown. 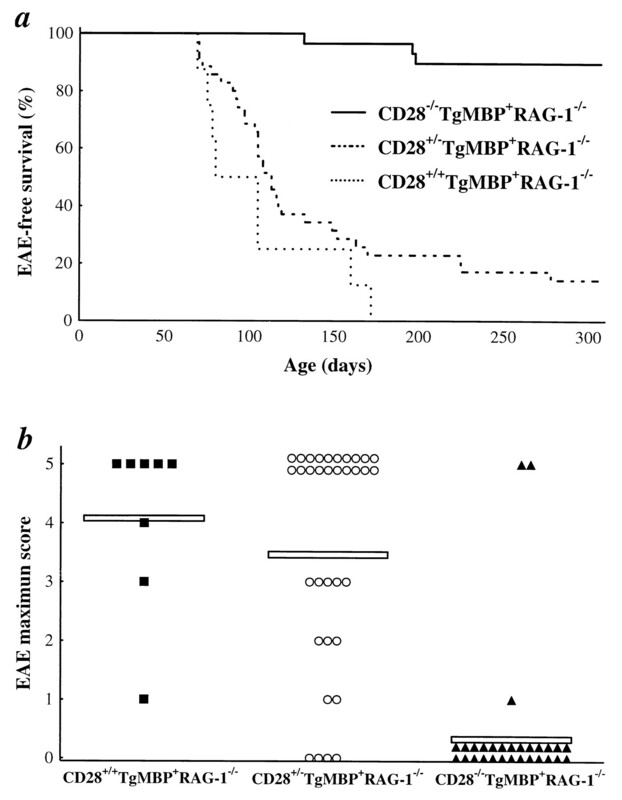 Most studies of EAE involve Ag immunization-induced models, in which T cell immune responses are not monoclonal but rather develop against several epitopes (5, 20). The CD28-dependency in the CD4+MBP-specific TCR transgenic EAE model could be thus limited to the MBP1–17 epitope. To exclude this possibility, we introduced the CD28 mutation into PL/J mice that develop severe EAE following immunization with MBP (1, 6). 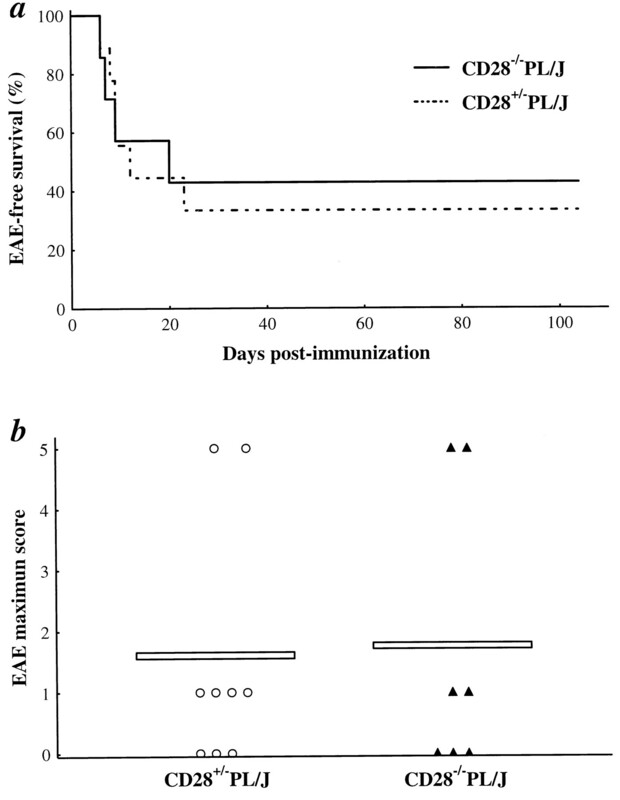 Immunization with whole MBP (200 μg/mouse) triggered the development of EAE in ∼75% of CD28+/− PL/J mice within a 100-day follow-up period (Fig. 4⇓a). The diseased mice developed severe EAE as determined by the EAE score (Fig. 4⇓b). As occurred in the case of spontaneous EAE in CD28−/−TgMBP+RAG1−/− mice, the majority (90%) of CD28−/− PL/J mice were protected from disease (Fig. 4⇓, a and b). Interestingly, even at low doses of MBP immunization (200 μg/mouse), CD28−/− PL/J mice produced MBP-specific IgG and IgM autoAbs at titers similar to those in CD28+/− PL/J mice (Fig. 4⇓c). However, MBP-specific in vitro T cell proliferation (Fig. 4⇓d) and IL-2 production (data not shown) were not detectable in CD28−/− PL/J mice. These data show that CD28 costimulation during T cell activation plays a crucial role in the induction of both spontaneous and Ag-induced EAE. CD28-null mutation abrogates MBP-induced EAE in PL/J mice, but the production of MBP-specific autoantibodies is preserved. Incidence (a) and severity (EAE score) (b) of MBP-induced EAE (200 μg/mouse) among CD28+/−PL/J and CD28−/−PL/J littermate mice. The differences in EAE-free survival and the mean EAE score between CD28−/− (n = 15) and CD28+/− (n = 18) littermates were statistically significant (respectively, Kaplan-Meyer survival curves [p = 0.00062] and analysis of variance [p = 0.000731], based on a 100-day follow-up period). b, EAE scores of individual mice are shown. Open bars indicate mean EAE scores of all mice in each group. c, MBP-specific IgM and IgG levels. Sera were collected from mice at 20, 40, and 60 days after MBP immunization and anti-MBP-specific IgG and IgM autoantibody titers were determined by ELISA as described in Materials and Methods. Ab titers are shown as mean value of OD ± SEM. One result representative of three experiments is shown. d, Proliferation of T cells induced with MBP. Lymph node T cells (2 × 105 cells/well) from CD28+/− PL/J and CD28−/− PL/J littermate mice were activated with the indicated concentrations of MBP whole protein. Unactivated T cells are shown as controls. After 60 h of stimulation, proliferation was determined by [3H]thymidine uptake. Mean values (±SEM) of [3H]thymidine uptake are shown. Since in vitro activation of CD28−/−CD4+TgMBP+RAG-1−/− T cells was dependent on the concentration of the Ag, we tested whether adminstration of higher MBP doses could increase the prevalence and severity of EAE in CD28−/− PL/J mice. Immunization with increased doses of MBP (400 and 600 μg/mouse) did not increase the incidence or severity of EAE in CD28+/− PL/J mice (Fig. 5⇓, a and b, and data not shown). However, following immunization with 400 μg MBP/mouse (data not shown) or 600 μgMBP/mouse (Fig. 5⇓, a and b), CD28−/− PL/J mice developed EAE with similar incidence and severity as CD28+/− PL/J mice. These data show that, at high Ag doses, EAE can be induced in the absence of CD28 expression. CD28-dependency of EAE development in PL/J mice can be overcome by high doses of MBP. Incidence (a) and EAE severity (EAE score) (b) of MBP-induced EAE (600 μg/mouse) among CD28+/− PL/J and CD28−/− PL/J littermate mice. The differences in EAE-free survival and the mean EAE score between CD28−/− (n = 7) and CD28+/− (n = 9) littermates were not statistically significant (respectively, Kaplan-Meyer survival curves [p = 0.97840] and analysis of variance [p = 0.884672], based on a 100-day follow-up period). EAE scores of individual mice are shown. Open bars indicate mean EAE scores in each group. Our results show that CD28 costimulation plays a crucial role in the development of spontaneous autoimmune EAE in TgMBP+RAG-1−/− mice as well as in MBP-induced EAE in PL/J mice. Proliferation and IL-2 production by MBP peptide-specific CD4+TgMBP+ T cells still occurred in vitro in the absence of CD28, albeit at lower levels than in CD28-expressing CD4+TgMBP+ T cells. Moreover, CD28−/− PL/J mice developed EAE at the same prevalence and severity as CD28+/− mice when immunized with a high concentration of MBP-autoantigen, indicating that the requirement for CD28 costimulation for disease development in vivo can be overcome by increased amounts of Ag. Our results demonstrate an important role for CD28 costimulation in the pathogenesis of spontaneous EAE in vivo. Full T cell activation requires a costimulatory signal in addition to TCR ligation, which is provided primarily by interactions between CD28 on T cells and B7 (CD80, CD86) counterreceptors on APCs. CD28 signaling allows T cell survival and long-term proliferation after antigenic challenge in vivo (21). Failure to activate the costimulatory signal results in T cell unresponsiveness or clonal anergy (11, 22), and, therefore, peripheral tolerance and control of autoimmunity are thought to rely on the absence of costimulatory signaling. Indeed, the CD28 counterreceptors CD80 and CD86 are expressed on inflammatory and glial cells in the CNS of diseased EAE mice as well as in CNS lesions from MS patients, and it has been shown that glial cells can function as APCs in vitro (23, 24, 25, 26). Development of EAE and relapses can be partially blocked by treatment with Abs and CTLA-4 fusion proteins that block CD28 costimulation (14, 15, 27, 28, 29). Alternatively, the course of EAE can be altered by treatments that block CTLA-4 function, leading to exacerbation of the disease (30, 31, 32). Furthermore, Lin et al. (33) have recently shown that blocking CTLA-4 during cardiac allograft in CD28-deficient mice accelerates the acute rejection, clearly demonstrating that CTLA-4 can exert its negative regulatory function independent of CD28. These data demonstrate the importance of costimulatory pathways in preventing the development of an autoimmune process. However, costimulatory pathways other than CD28/B7/CTLA-4 also contribute to T cell activation in vivo, and that might be an explanation for why higher doses of Ag can overcome CD28-dependence for EAE development in MBP-immunized mice. Indeed, it has been demonstrated that EAE development is abrogated in CD40 ligand (CD40L)-deficient mice, showing the role of the CD40-CD40L costimulatory pathway in the control of T cell activation in vivo (34). Furthermore, in a PLP peptide-induced model of EAE, the treatment with anti-CD40L Ab protected mice when low doses of immunogen were used, while at high doses, T cell activation and disease occurred even with anti-CD40L treatment, albeit in this case the disease was in a mild form (35). Intruigingly, in our study, CD4+ T cells isolated from CD28−/−TgMBP+RAG-1−/− mice still proliferated in response to the MBP1–17 peptide in vitro, and immunization with high doses of the autoantigen induced EAE at high prevalence and severity in CD28−/− PL/J mice. These results indicate that CD28 does not regulate immunological anergy in vivo but rather adjusts the threshold for the activation of MBP-specific T cells. Recently, it has been shown that in the absence of CD28, continued stimulation of the Ag receptor alone, either through prolonged viral replication or repeated peptide injection, prevents the induction of anergy and generates a functional CD8+ T cell response in vivo (36). By contrast, transient stimulation of the Ag receptor in the absence of CD28 costimulation induces anergy in CD8+ T cells (36). Furthermore, CD28 surface expression reduces the number of TCRs that need to be triggered for T cell activation and allows activation of T cells by low-affinity ligands (37). These effects have been described in viral-specific CD8+ T cells. However, it is possible that CD28 costimulation is required to lower the threshold for TCR activation of autoaggressive CD4+ T cells to trigger an autoimmune response. This hypothesis is in line with the finding that spontaneous and MBP-induced EAE are abrogated in the absence of CD28, but functional autoaggressive T cells are still present in CD28−/− mice. Based on functional data from CD28−/−TgMBP+RAG-1−/− and CD28−/− PL/J mice, we propose the following model for CD28-regulated EAE. Low numbers of naive autoaggressive T cells cross the blood-brain barrier and encounter myelin sheath-specific Ags that might be presented at low density by the microglia within the healthy CNS. In this case, CD28 expression is clearly required for the activation of resting, autoreactive T cells. Hypothetically, CD28 costimulation lowers the threshold for effective Ag receptor-mediated stimulation, while CD28-deficiency results in a short-lived, low-avidity TCR engagement by CD4+TgMBP+ T cells within the CNS. Thus, CD28−/− T cells are unable to trigger an autoimmune response and cannot activate the cytokine circuits responsible for the attraction of mononuclear cells and the establishment of an inflammatory response. Current understanding of the requirements for T cell activation unveils costimulatory pathways as potential targets for therapeutic intervention in MS, as well as other autoimmune diseases. Particularly, CD28 pathway presents itself as an attractive target, and our results provide the first genetic evidence that CD28 costimulation is crucial in the pathogenesis of spontaneous EAE. We thank M. Saunders for scientific editing, and K. Bachmaier, I. Kozieradzki, A. Hakem, M. Nghiem, Y. Y. Kong, C. Krawchuck, Q. Liu, and T. Sasaki for helpful comments. ↵1 J.M.P. is supported by a grant from the Medical Research Council of Canada. ↵3 Abbreviations used in this paper: MS, multiple sclerosis; CNS, central nervous system; EAE, experimental autoimmune encephalomyelitis; MBP, myelin basic protein; PE, phycoerythrin.